PANCASILA is Indonesia National Ideology and Constitution. First Draft of PANCASILA was made by President Soekarno on 01 June 1945. Bhinneka Tunggal Ika is the official national motto of Indonesia. The phrase is Old Javanese translated as Unity in Diversity. 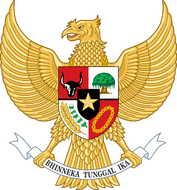 It is inscribed in the Indonesian national symbol, Garuda Pancasila. It is so important that there is a national song for it which children learn in school an you will definitely hear on the newly implemented Hari Lahir Pancasila on 1st of June 2017.